From the Medicine Service, Veterans Affairs (VA) Medical Center; Department of Medicine at the School of Medicine, and Division of Epidemiology at the School of Public Health, University of Alabama at Birmingham, Birmingham, Alabama; Department of Orthopedic Surgery, Mayo Clinic College of Medicine, Rochester, Minnesota; University of California at San Francisco, San Francisco, California; University of Oregon, Portland, Oregon, USA; Ottawa Heart Institute and the University of Ottawa, Ottawa, Ontario, Canada. Objective. To compare benefits and harms of lupus nephritis (LN) induction and maintenance treatments. Methods. We performed a systematic review and Bayesian network metaanalyses of randomized controlled trials (RCT) of immunosuppressive drugs or corticosteroids (CS) in LN. OR and 95% credible intervals (CrI) were calculated. Results. There were 65 RCT that met inclusion and exclusion criteria. Significantly lower risk of endstage renal disease (ESRD; 17 studies) was seen with cyclophosphamide (CYC; OR 0.49, 95% CrI 0.25–0.92) or CYC + azathioprine (AZA; OR 0.18, 95% CrI 0.05–0.57) compared with standard-dose CS, and with high-dose (HD) CYC (OR 0.16, 95% CrI 0.03–0.61) or CYC + AZA (OR 0.10, 95% CrI 0.03–0.34) compared with HD CS. HD CS was associated with higher risk of ESRD compared with CYC (OR 3.59, 95% CrI 1.30–9.86), AZA (OR 2.93, 95% CrI 1.08–8.10), or mycophenolate mofetil (MMF; OR 7.05, 95% CrI 1.66–31.91). Compared with CS, a significantly higher proportion of patients had renal response (14 studies) when treated with CYC (OR 1.98, 95% CrI 1.13–3.52), MMF (OR 2.42, 95% CrI 1.27–4.74), or tacrolimus (TAC; OR 4.20, 95% CrI 1.29–13.68). No differences were noted for the risk of malignancy (15 studies). The risk of herpes zoster (17 studies) was as follows: OR (95% CrI) MMF versus CS 4.38 (1.02–23.87), CYC versus CS 6.64 (1.97–25.71), TAC versus CS 9.11 (1.13–70.99), and CYC + AZA versus CS 8.46 (1.99–43.61). Conclusion. Renal benefits and the risk of herpes zoster were higher for immunosuppressive drugs versus CS. Data on relative and absolute differences are now available, which can be incorporated into patient-physician discussions related to systemic lupus erythematosus medication use. One-third of all patients with systemic lupus erythematosus (SLE) initially present with nephritis and 50%–60% develop nephritis during the first 10 years1,2. Lupus nephritis (LN) accounts for 2% of all endstage renal disease (ESRD) in the United States3. It leads to premature death and the overall survival is 88% at 10 years4,5,6,7. Immunosuppressive drugs, such as mycophenolate mofetil (MMF), cyclophosphamide (CYC), azathioprine (AZA), etc., improve LN outcomes8 and are frequently used with corticosteroids (CS)8. Because of their efficacy in LN, immunosuppressive drugs also reduce the cumulative CS dose and associated side effects9,10,11. They differ from each other in safety during pregnancy, administration route, frequency of dosing, and cost. For example, MMF is contraindicated for use in pregnancy, whereas clinicians consider AZA a safer option12. A major challenge to understanding comparative effectiveness is that few SLE treatments have been compared directly in large head-to-head clinical trials, yet clinicians and patients have to choose among them. It is, therefore, critical to generate comparative effectiveness research (CER) data to compare the effectiveness (and safety) of medications for LN to enable informed decision making. Two common methods for CER are registry/large observational studies examining comparative efficacy and harms (has limitation of various biases, but provides the real-world data) versus examining the data from randomized controlled trials (RCT) with new approaches that can perform indirect comparisons (has limitation of short followup, but has no/minimal biases). These approaches complement each other in uncovering new knowledge, and often confirm or refute anecdotal observations made by clinicians and provide a higher evidence level for clinical observations by individual practitioner. Patients and physicians can use this information related to comparative risks/benefits in medication decision making based on their values, preferences, knowledge, and risk averseness. The 2012 American College of Rheumatology (ACR) LN treatment guidelines literature review8 and the Cochrane systematic review of interventions for LN13 assessed literature up to 2010 and 2012, respectively. Neither performed indirect comparisons. A recent network metaanalysis (NMA) was focused only on the comparative effectiveness of 4 treatments for the maintenance phase and analyzed only 6 studies14. Therefore, evidence synthesis using methods to obtain indirect comparisons of efficacy/harms, such as an NMA, is needed. This may uncover new knowledge, as noted previously15,16,17. We aimed to perform a comprehensive NMA and systematic review for both induction and maintenance treatments for LN. Our main study objective was to examine randomized trials to assess comparative efficacy and harms of immunosuppressive drugs and CS in LN, incorporating indirect comparisons of treatments using the NMA. Our study, funded by the Patient-centered Outcomes Research Institute (PCORI), provided critical knowledge to build an SLE guide and is currently being tested in a trial. We used rigorous methods for the systematic review and NMA based on the Agency for Healthcare Research and Quality recommendations18, the Cochrane handbook19, and the Preferred Reporting Items for Systematic reviews and Meta-Analyses guidelines20. The Institutional Review Board at the University of Alabama at Birmingham approved the study. We included RCT or controlled clinical trials for LN published in English that contained CS or immunosuppressive drugs such as CYC, MMF, AZA, cyclosporine (CSA), tacrolimus (TAC), or rituximab (RTX), and reported any safety or efficacy outcome. Belimumab studies could not be included in our systematic review because these studies included patients with active SLE, most excluding active LN. A Cochrane systematic review of belimumab for SLE is under way21. We had multiple prespecified sources of data as detailed below. There were no restrictions with regard to dosage or duration of intervention, i.e., the medication intake. We updated 2 systematic reviews8,13 with efficacy and safety data from their search end dates (January 2010 and April 2012, respectively) to September 2013. We used the raw data abstracted for this review up to January 2010. An expert librarian (JJ) searched the OVID Medline database from January 2010 (last date for the systematic review for the 2012 ACR LN treatment guidelines) to September 2013. The study protocol was registered in the PROSPERO database: CRD42016032965 (www.crd.york.ac.uk/PROSPERO). P: Patients were adults 18 years or older, meeting the 1987 ACR classification criteria for SLE22. I: Interventions were immunosuppressant alone or in combination with other immunosuppressant or biologics. Medication doses were categorized as low, standard, or high dose (LD, SD, and HD; Supplementary Data 1, available online at jrheum.org). C: Placebo or another immunosuppressive drug with/without biologic or CS. Efficacy was assessed with 4 key outcomes (for detailed definitions, see Supplementary Data 1, available online at jrheum.org). ESRD and renal response were the 2 main efficacy outcomes. We also assessed renal relapse12 and renal failure [doubling of creatinine or decrease in glomerular filtration rate (GFR) > 20%] as secondary efficacy outcomes. Malignancy and herpes zoster were the main harm outcomes. We chose these outcomes because patients commonly worry about and ask about the risk of infection and cancer with SLE treatments during treatment decision making. Other harms we assessed were gastrointestinal (GI) side effects (GI upset, diarrhea, etc. ), nausea, alopecia, mycobacterial infections, hyperglycemia/diabetes, avascular necrosis/osteonecrosis, mortality, amenorrhea, cytopenia, and urinary bladder toxicity (including hemorrhagic cystitis and hematuria). We considered using harms data related to CS and immunosuppressive drugs from any SLE RCT, not just from an LN RCT, to have a larger sample. Our a priori assumption was that most treatment-related harms did not depend much on whether kidneys were currently involved by SLE; an approach similar to another published NMA of harms15. A librarian (CH) performed a search for all SLE trials (excluding LN) in OVID Medline and SCOPUS from inception to February 2014. Examination of the data from this search revealed little additive data for harms for most outcomes of interest (16 RCT, but most had no usable data). Given the added limitation of study population heterogeneity, we determined that the advantages of including these data were outweighed by the disadvantages. Therefore, these data were not included in our analyses. Two trained abstractors (research associate, data programmer) independently reviewed abstracts and titles in duplicate (AO, AB), discussed to resolve disagreements, and performed consensus. An adjudicator (JS) resolved any disagreements not resolved by consensus. All data were abstracted by 2 independent abstractors (AO, AB) directly into Microsoft Excel sheets. Two reviewers abstracted risk of bias (AO, JS) according to the Cochrane risk of bias tool23. We examined each of the following domains as low, high, or unclear risk of bias: randomization sequence generation, allocation sequence concealment, blinding of participants, personnel and outcome assessors, incomplete outcome data (primary outcome data reporting, dropout rates and reasons for withdrawal, appropriate imputation of missing data, an overall completion rate ≥ 80%), and selective outcome reporting and other potential threats to validity (relevant use of co-interventions, bias because of funding source). An unclear risk of bias was designated when there was a lack of information or uncertainty about potential for bias. An adjudicator (JS) resolved any disagreements not resolved by consensus. An expert rheumatologist (JS) and an expert in SLE (JG) examined for similarity of studies (study population and interventions) prior to performing evidence synthesis. Bayesian-mixed treatment comparison (MTC) metaanalyses24,25,26 were conducted to assess comparative effectiveness of various immunosuppressive drugs compared with each other and with CS, corresponding to the main treatment decision points in patients with LN. When not specified, medication dose is the SD. WinBUGS software (MRC Biostatistics Unit) was used to conduct Bayesian MTC metaanalysis using a binomial likelihood model that allows for the use of multiarm trials27,28. Random-effects NMA were conducted; Ohlssen, et al outlined the Bayesian fixed- and random-effects models for NMA approaches when considering safety outcomes and the rarity often associated with such outcomes29. Assessment of model fit and choice of model was based on the assessment of the deviance information criterion and comparison of residual deviance to number of unconstrained data points27,30. Point estimates (OR and relative risk) and 95% credible intervals (CrI) for OR were derived using Markov Chain Monte Carlo methods. Vague priors, such as n (0–1002), were assigned the basic variables identifying the treatment contrasts throughout27 and informative priors (prior = 0.292) for the variance variable were based on Turner, et al31. We assumed a common between-study variance for all treatment contrasts for each of the outcomes. To ensure that convergence was reached, trace plots and the Brooks-Gelman-Rubin statistic were assessed32. Three chains were fit in WinBUGS for each analysis, with 40,000 iterations, and a burn-in of 40,000 iterations32,33. Both MTC and traditional metaanalysis require studies to be sufficiently similar to pool their results. To further investigate heterogeneity, where warranted, subgroup analyses and metaregressions28,34 were considered. We examined consistency-inconsistency plots for evidence of inconsistency, and chose the appropriate model for our analyses. Model diagnostics including trace plots and the Brooks-Gelman-Rubin statistic were assessed to ensure model convergence27,32. Graphical aids, in the form of network diagrams, were considered for NMA. Our main analysis combined data from all LN trials (induction, maintenance, and induction and maintenance), as per an a priori decision to maximize power for our analysis. We also performed a subgroup analysis for efficacy outcomes by induction trial phase (maintenance phase studies were too few to perform meaningful analysis), because efficacy may differ by induction versus maintenance phases. We identified a total of 65 studies that met inclusion and exclusion criteria12,35–44,45–54,55–64,65–74, 75–84,85–94,95,96,97,98 (Table 1; Supplementary Data 2, available online at jrheum.org). Number of studies and patients for each outcome are shown in Table 2. The characteristics of included trials (demographic and treatment of this patient population) and risk of bias are shown in Table 1 and Supplementary Table 1 (available online at jrheum.org). Most studies compared regimens for treatment induction or induction and maintenance (88%) and few compared maintenance regimens only (12%). Sample size ranged from 10–370. Of these studies, 37% were published in 2000 or before, 32% were conducted in the United States, and 43% were multicenter. Included trials studied SLE treatments such as CYC, MMF, AZA, calcineurin inhibitors (CSA, TAC), RTX, CS, plasmapheresis, and leflunomide. No. studies and patients included for each outcome of interest. Major outcomes are in bold face. The overall risks of bias of all studies included in our systematic review were as follows: randomization sequence generation: high 5%, low 56%, unclear 39%; allocation sequence concealment: high 3%, low 38%, unclear 61%; blinding of outcome assessors/physician: high 18%, low 59%, unclear 22%; blinding of participants: high 16%, low 54%, unclear 29%; incomplete outcome data: high 13%, low 57%, unclear 29%; selective outcome reporting: high 8%, low 44%, unclear 47%; and funding bias: high 3%, low 33%, unclear 64%. Crude event rates for outcomes assessed are provided in Supplementary Table 2 (available online at jrheum.org). Several outcomes were rare (event rate 5% or lower mostly), including amenorrhea, mycobacterial infections, nausea, etc. (Supplementary Table 2, available online at jrheum.org). The results of the systematic reviews provided the data to construct evidence networks for each outcome, using statistical modeling of drug comparisons using NMA (indirect evidence). An exemplar of an evidence network is provided in Figure 1 for ESRD, a key efficacy outcome. NMA results, for each of the evidence network considered, are summarized below and detailed in Table 3, Table 4, Table 5, Table 6, and Supplementary Tables 3–10 and Supplementary Figures 1–4 (available online at jrheum.org). The SD is implicit by the mention of the drug name only; HD and LD are specified in each case, where doses other than SD were used. Evidence network for endstage renal disease. The width of lines for each connection in the evidence network is proportional to the number of randomized controlled trials comparing each pair of treatments. The size of each treatment node is proportional to the number of randomized participants (sample size). The number of patients exposed to each respective treatment is shown next to each treatment. Endstage renal disease: OR, RR, and RD for all treatment comparisons using the random-effects model. Estimates are derived from random effects, Bayesian network metaanalysis, which treats between-study variance as an informative prior (log normal distribution). The similarity of residual deviance for a random-effects model compared with the fixed-effects model shows the robustness of our finding. Renal response: OR, RR, and RD for all treatment comparisons using the random-effects model. Estimates are derived from random-effects, Bayesian network metaanalysis, which treats between-study variance as an informative prior (log normal distribution). The similarity of residual deviance for random-effects model compared with the fixed-effects model shows the robustness of our finding. Data are based on comparisons of each treatment with prednisone or other immunosuppressive drugs. Malignancy: OR, RR, and RD for all treatment comparisons using the random-effects model. Estimates are derived from random-effects, Bayesian network metaanalysis, which treats between-study variance as an informative prior (log normal distribution). The similarity of residual deviance for random-effects model compared with the fixed-effects model shows the robustness of our finding. Herpes zoster: OR, RR, and RD for all treatment comparisons using the random-effects model. Estimates are derived from random-effects, Bayesian network metaanalysis, which treats between-study variance as an informative prior (log normal distribution). The similarity of residual deviance for random-effects model compared with the fixed-effects model shows the robustness of our finding. We assessed 4 a priori defined renal benefits, summarized below, including prevention of ESRD and renal response (primary benefit/efficacy outcomes), and prevention of renal relapse and deterioration of kidney function (secondary benefit/efficacy outcomes; Supplementary Data 1, available online at jrheum.org). Thirteen 2-arm, two 3-arm, and two 4-arm trials (1388 patients) provided data. Most RCT included MMF (n = 6), CYC (n = 9), AZA (n = 9), or CS (n = 6). Significantly lower risk of ESRD were seen in the following groups compared with SD CS: (1) CYC (OR 0.49, 95% CrI 0.25–0.92) or CYC + AZA (OR 0.18, 95% CrI 0.05–0.57) compared with CS; (2) HD CYC compared with HD CS (OR 0.16, 95% CrI 0.03–0.61); and (3) CYC + AZA compared with HD CS (OR 0.10, 95% CrI 0.03–0.34). HD CS was associated with higher risk of ESRD compared with CYC (OR 3.59, 95% CrI 1.30–9.86), AZA (OR 2.93, 95% CrI 1.08–8.10), and MMF (OR 7.05, 95% CrI 1.66–31.91; Table 3). Importantly, no significant between-immunosuppressive drug (CYC, MMF, TAC, AZA, etc.) differences were noted. Twelve 2-arm studies and two 3-arm studies (1290 patients) provided data. Most studies included CYC (n = 14), CS (n = 5), or MMF (n = 8). Compared with CS, a significantly higher proportion of patients had renal response when treated with CYC (OR 1.98, 95% CrI 1.13–3.52), MMF (OR 2.42, 95% CrI 1.27–4.74), or TAC (OR 4.20, 95% CrI 1.29–13.68; Table 4). No significant differences were noted between immunosuppressive drugs. Fourteen 2-arm studies and two 3-arm studies (627 patients) provided data and mostly included CS (n = 2), AZA (n = 6), MMF (n = 4), and CYC (n = 4). Compared with CS, MMF and CYC (SD and LD combined) were associated with lower odds, 0.16 and 0.23, respectively, and compared with AZA, MMF was associated with lower odds of 0.43 of renal relapse (Supplementary Table 3, available online at jrheum.org). Thirteen 2-arm and two 3-arm studies (993 patients) provided data. HD CYC was associated with lower odds of deterioration of kidney function compared with SD or HD CS, AZA, or plasmapheresis, ranging from 0.10 to 0.29 (Supplementary Table 4, available online at jrheum.org). Fourteen 2-arm studies and one 3-arm study (1128 patients) provided data. Studies included AZA (n = 5), MMF (n = 4), CYC (n = 4), or CS (n = 2). No significant between-treatment differences were noted (Table 5). Most induction RCT were 6 months in duration, and induction and maintenance RCT were 1.5- to 2-years long. Seventeen studies provided data: fifteen 2-arm and 1 each of 3- and 4-arm studies (1423 patients). Studies included AZA (n = 4), MMF (n = 9), CYC (n = 4), or CS (n = 3). Compared with SD CS, several immunosuppressive drugs were associated with higher odds of herpes zoster: MMF 4.4, CYC 6.6, TAC 9.1, and CYC + AZA 8.5, respectively (Table 6). Details of number of studies and treatments compared for other harms are provided in Supplementary Tables 5–10 and Supplementary Figures 1–4 (available online at jrheum.org). In NMA, HD CYC was associated with significantly higher odds of the following: (1) GI side effects: versus MMF, 3.3× higher odds, and versus TAC, 8.2× higher odds (Supplementary Table 5, available online at jrheum.org); and (2) alopecia: versus MMF, 4.5× higher odds (Supplementary Table 6, available online at jrheum.org). No significant between-treatment differences were noted for odds of nausea (Supplementary Table 7, available online at jrheum.org), diabetes/hyperglycemia (Supplementary Table 8), avascular necrosis/osteonecrosis (Supplementary Table 9), and mortality (Supplementary Table 10). For 4 outcomes, data were available only for comparison of 2 treatments, and therefore only traditional metaanalyses could be performed. We noted the following differences: (1) mycobacterial infections: MMF versus HD CYC, 7.5× higher odds (Supplementary Figure 1, available online at jrheum.org); (2) amenorrhea: MMF versus CYC (HD and LD combined owing to few data), OR 0.17 (Supplementary Figure 2); (3) urinary bladder toxicity (hemorrhagic cystitis/hematuria): CYC versus CS, OR 9.7 (Supplementary Figure 3); and (4) cytopenia: HD CYC versus MMF, higher odds of 1.69 (Supplementary Figure 4). When the consistency assumption could be evaluated, we did not find any evidence of inconsistency in the NMA for various outcomes after examining the consistency-inconsistency plots (Supplementary Figure 5, available online at jrheum.org). Nine 2-arm, one 3-arm, and two 4-arm trials (890 patients) provided ESRD data. Findings were similar to the overall analysis. Significantly lower risks of ESRD were seen in the following groups compared with SD CS: (1) CYC (OR 0.47, 95% CrI 0.25–0.92) or CYC + AZA (OR 0.20, 95% CrI 0.05–0.68) compared with CS; (2) HD CS compared with CYC (OR 4.83, 95% CrI 1.55–16.11) and AZA (OR 3.46, 95% CrI 1.08–12.15); and (3) CYC + AZA compared with HD CS (OR 0.09, 95% CrI 0.02–0.33; Supplementary Table 11, available online at jrheum.org). Importantly, no significant between–immunosuppressive drug (CYC, MMF, TAC, AZA, etc.) differences were noted. Eleven 2-arm studies and two 3-arm studies (920 patients) provided data. Compared with CS, a significantly higher proportion of patients had renal response when treated with CYC (OR 2.01, 95% CrI 1.10–3.64), MMF (OR 2.74, 95% CrI 1.31–5.91), or TAC (OR 4.33, 95% CrI 1.24–15.25; Supplementary Table 12, available online at jrheum.org). No significant differences were noted between immunosuppressive drugs. Three 2-arm studies (145 patients) provided data. Compared with CS and AZA, CYC (SD and LD combined) were associated with lower odds of renal relapse, with OR 0.15 (95% CrI 0.03–0.70) and 0.19 (95% CrI 0.04–0.76), respectively (Supplementary Table 13, available online at jrheum.org). Nine 2-arm and two 3-arm studies (669 patients) provided data. HD CYC was associated with lower odds of deterioration of kidney function compared with SD or HD CS, with OR 0.29 (95% CrI 0.08–0.97) and 0.10 (95% CrI 0.01–0.84), respectively (Supplementary Table 14, available online at jrheum.org). Table 7 shows a staircase diagram comparing CS to common/standard immunosuppressive doses and combinations of immunosuppressive drugs, another way to depict the results of NMA for 2 outcomes. A side-by-side comparison of odds can be made between treatments using this approach. There were no significant differences between treatments, except for significantly lower odds of ESRD with CYC compared with CS (Table 7). For example, CYC use was significantly less likely (0.49 times) than CS to be associated with ESRD, but not significantly different regarding the risk of malignancy. Staircase diagram comparing the risk of ESRD (above) versus malignancy (below). Values are OR (95% CrI). To our knowledge, ours is one of the first comprehensive systematic reviews, metaanalyses, and NMA of immunosuppressive drugs and CS for the treatment of LN. We noted differences in the efficacy and the harms of various treatments. By incorporating indirect and direct comparisons in the NMA, we present a comprehensive assessment of comparative benefits and harms of LN treatments. We noted no differences in the risk of malignancy, diabetes/hyperglycemia, osteonecrosis, nausea, and mortality among immunosuppressive drugs. About half of the studies had a low risk of bias on the Cochrane risk of bias tool. It is just as important to pay attention to the lack of differences among immunosuppressive drugs as to significant differences. The 4- to 9-fold higher risk of herpes zoster with various immunosuppressive drugs compared with CS is the first quantification of the risk of herpes zoster with immunosuppressive drugs in patients with LN, to our knowledge. The 17 included studies had patients with mean age ranging 29 years to 36 years followed for 6 months to 7 years (8 studies lasting 6 mos). Thus, these very young patients with LN are at high risk of herpes zoster, with risk relatively higher than patients with noninflammatory musculoskeletal conditions99. Herpes zoster is a potentially preventable disease by the use of a vaccine, and patients with SLE mount a good immune response to this vaccine100. Given the availability of a vaccine to prevent herpes zoster, we believe that zoster vaccination should be administered prior to immunosuppressive initiation. The immunosuppressive state in most LN might persuade some clinicians to consider the administration of zoster vaccination in younger patients after evaluating individualized risk-benefit ratio for each patient. At the very least, all patients 60 years and older with SLE should be immunized prior to immunosuppression initiation, as per the US Centers for Disease Control and Prevention recommendation for zoster vaccine use in that population101; on the other hand, the US Food and Drug Administration packet insert for the vaccine allows it for patients 50 years or older102. A recent NMA was focused only on comparative effectiveness of 4 treatments (CYC, AZA, MMF, prednisone vs comparator) for the maintenance phase, and analyzed only 6 studies14. The OR (95% CrI) of developing renal failure at 2–3 years was 0.72 (0.11–4.49) for AZA versus CYC, 0.32 (0.04–2.25) for MMF versus CYC, 2.40 (0.22–36.94) for prednisone alone versus CYC, and 0.45 (0.11–1.48) for MMF versus AZA. There was no conclusive evidence of superiority of 1 regimen over another. In another NMA of induction therapies for SLE, there were no differences between CYC, MMF, and TAC for creatinine or proteinuric remission at 6 months103. Our NMA differed from these previous NMA in the outcomes examined (benefits and harms) and the approach (induction and maintenance trials combined to get maximum power for comparative efficacy and safety of SLE treatments). Interestingly, there were no differences among immunosuppressive drugs or the immunosuppressive drugs and CS for the risk of malignancy. The number of studies was few for some comparisons, indicating that the lack of significance may be due to the lack of association, or more likely an insufficient power to detect a small difference. Such a small difference may or may not be clinically meaningful. Importantly, as has been noted in previous similar analyses, it is very difficult to see differences in cancer rates in RCT settings given the short trial duration, because the development of cancers usually takes years. Most induction RCT were 6 months in duration, and induction and maintenance RCT were 1.5- to 2-years long, with very few lasting > 2 years. Thus, the lack of differences should not be interpreted as all treatments imparting equal risk. Well-designed longterm cohort and registry studies are needed to answer this question. Similarly, no risk differences were noted for diabetes/hyperglycemia, osteonecrosis, and mortality; again these are events with low incidence rates and we were under-powered to detect differences. An important finding was that there was no difference in renal outcomes between immunosuppressive drugs, with 1 exception, i.e., compared with AZA, MMF was associated with lower odds of 0.43 of renal relapse. Both the findings of MMF being superior to AZA and the absence of any other differences in renal outcomes between various immunosuppressive drugs are noteworthy. Because our study aggregated all data, our findings summarize the experience to date. This indicates that several effective treatment options are available for LN. We cannot rule out minor but clinically important differences among these treatments, which may become obvious once more data become available. With the currently available data, MMF is only superior to AZA for the risk of renal relapse. We found notable differences in the efficacy between CS and immunosuppressive drugs. Significantly lower risk of ESRD were seen in CYC and CYC + AZA compared with CS, with OR of 0.18 to 0.48, and for MMF, CYC, HD CYC, and CYC + AZA compared with HD CS, with OR ranging from 0.10 to 0.28. The higher efficacy of immunosuppressive drugs compared with CS is well recognized and widely published in the literature and reiterated in the 2012 ACR LN treatment guidelines8. Our systematic review and NMA advances this knowledge by providing the magnitude of these differences. This evidence emphasizes the importance of immunosuppressive drugs in preventing renal damage in patients with LN. A 2–10× higher risk of ESRD with CS alone compared with most immunosuppressive drugs might be helpful in convincing a skeptical patient, who considers immunosuppressive drugs as a “cancer drug” and might consider using CS alone for the treatment of LN, without realizing the true efficacy of immunosuppressive drugs versus CS. Similar findings were observed for other renal efficacy outcomes. In practice, a combination of immunosuppressive drugs and CS is used for most optimal renal outcomes. Some side effects differed between immunosuppressive drugs. Both HD CYC and LD CYC were each associated with 17- to 25-fold higher odds of cytopenia than MMF or CSA. This information is very helpful, because it allows for a more informed discussion of benefits/harms prior to the initiation of immunosuppressive drugs. Instead of saying to the patient, “Your risk of low blood counts is higher with CYC than MMF,” one can quantify this risk either numerically or qualitatively depending on patient preference [i.e., “the risk is 17- to 25–fold higher” or “the risk is much (or very much) higher”]. CYC was associated with 4.5× higher odds of alopecia as compared with MMF. This information may be particularly helpful during treatment decision making to young patients, especially women, who may be very concerned about hair loss. HD CYC was associated with 3.3× higher odds of GI side effects compared with MMF and 8.2× higher odds compared with TAC. The GI tolerability of an immunosuppressive drug likely contributes to the adherence rates, and seems to be an important harm to keep in mind. Healthcare providers usually address this risk before initiation in most/all patients and during the initial few days to improve the likelihood of continuation of CYC by the use of concomitant antiemetics, if nausea is mild and/or tolerable. CYC was associated with 9.7× higher odds of urinary bladder toxicity (hemorrhagic cystitis/hematuria) compared with CS, which was statistically significant. This is not surprising, because urinary bladder toxicity with the use of CYC is well known. Our study has other limitations that deserve further discussion. Because of the inclusion of short-term RCT with limited person-years exposure, we may have missed harms that are associated with longer-term use. Most NMA and metaanalyses included a small number of patients (usually < 1000), despite combining all the available data. Therefore, we suspect that we may have missed some important differences between various treatments of LN because of low power, i.e., type II error. Another possibility is the lack of differences between these treatments with regards to certain side effects. Our current analysis does not allow us to distinguish these 2 possibilities. Only 50% of the studies included in our systematic review had low risk of bias on various criteria, and the risk of bias was unclear for the majority of the remaining studies. This must be considered while interpreting results from our study. The number of trials and data available for maintenance-only trials was too few, not allowing us to perform a meaningful NMA analysis for this subgroup, in contrast to the subgroup analyses we performed for induction trials. We used a random-effects model, because it may work better than a fixed-effect model for rare events, because it can incorporate informative prior distributions on variables expressing between-study variability. Multiple comparisons raise the possibility of some comparisons being significant just by chance. However, given the small sample sizes, short followup, and the rarity of most outcomes, type II error (not type I error) is the main study limitation, i.e., we likely missed some real differences due to lack of data, e.g., osteonecrosis risk with CS versus immunosuppressive drugs. In general, it is noted that the NMA has an inflated rate of type I error and a low statistical power in the existence of heterogeneity104. Although 2 clinicians examined the studies for clinical heterogeneity prior to study inclusion in NMA and found no evidence of significant heterogeneity, some heterogeneity between patient populations enrolled in the studies may have contributed at least partially to some differences between treatments that we noted in indirect comparisons. When the consistency assumption could be evaluated, we did not find any evidence of inconsistency in the NMA. Because we assumed a common between-study variance for all treatment contrasts for each of the outcomes, if there were substantive heterogeneity of the between-study variances within a network, the priors effect would be a tighter CrI but a similar point estimate. Our systematic review and NMA found that, for renal outcomes, immunosuppressive drugs were better than CS, both clinically and statistically. No significant between-immunosuppressive drug difference was seen for renal outcomes, except that MMF was better than AZA in preventing renal relapse. We noted significant differences among immunosuppressive drugs and/or CS for herpes zoster, alopecia, GI tolerability, amenorrhea, leukopenia, and urinary bladder toxicity. No differences were noted between various immunosuppressive drugs for several harms, including the risk of cancer, diabetes, osteonecrosis, nausea, and mortality; some lack of differences may be due to rarity of outcomes. Our current study offers a better knowledge of (relative and absolute) comparative efficacy and harms of LN treatments. This knowledge can help patients with the choice of the best medication for them based on their comorbidity profile, childbearing potential, beliefs/values regarding specific harm/s, and preferences. These data were incorporated into a patient-decision aid, which is being tested in a PCORI-funded randomized trial in patients with LN. We thank the 3 librarians, Tamara Rader (TR) from the Cochrane Collaboration, Janet Joyce (JJ) from the American College of Rheumatology, and Carolynn Holmes (CH) from the University of Alabama at Birmingham for performing the literature searches. We thank Aseem Bharat for screening titles and abstracting data. We thank Nipam Shah at the University of Alabama at Birmingham for a careful review of the final manuscript and for checking the accuracy of numbers compared with results of the analyses. We thank the American College of Rheumatology Lupus Nephritis guidelines team, especially Dr. Bevra Hahn, for sharing their evidence report tables with us. Supported by the research contract CE-1304-6631 from the Patient-centered Outcomes Research Institute (PCORI). JAS is also supported by the resources and facilities at the VA Medical Center at Birmingham, Alabama. KW, AO, JG, and GAW were supported in part by the PCORI contract CE-1304-6631. Accepted for publication June 20, 2016.
. Baseline characteristics of a multiethnic lupus cohort: PROFILE. Lupus 2002;11:95–101.
. Predictors of survival in systemic lupus erythematosus. Medicine 2006;85:147–56. Distribution of primary renal diseases leading to end-stage renal failure in the United States, Europe, and Australia/New Zealand: results from an international comparative study. Am J Kidney Dis 2000;35:157–65.
. Ethnicity and mortality from systemic lupus erythematosus in the US. Ann Rheum Dis 2006;65:1500–5. Prognosis in proliferative lupus nephritis: the role of socio-economic status and race/ethnicity. Nephrol Dial Transplant 2003;18:2039–46.
. American College of Rheumatology guidelines for screening, treatment, and management of lupus nephritis. Arthritis Care Res 2012;64:797–808.
. Oral corticosteroids and fracture risk: relationship to daily and cumulative doses. Rheumatology 2000;39:1383–9. Adverse effects of oral corticosteroids in relation to dose in patients with lung disease. Thorax 2001;56:279–84. Treatment for lupus nephritis. Cochrane Database Syst Rev 2012;12:CD002922.
. Immunosuppressive therapies for the maintenance treatment of proliferative lupus nephritis: a systematic review and network metaanalysis. J Rheumatol 2015;42:1392–400. 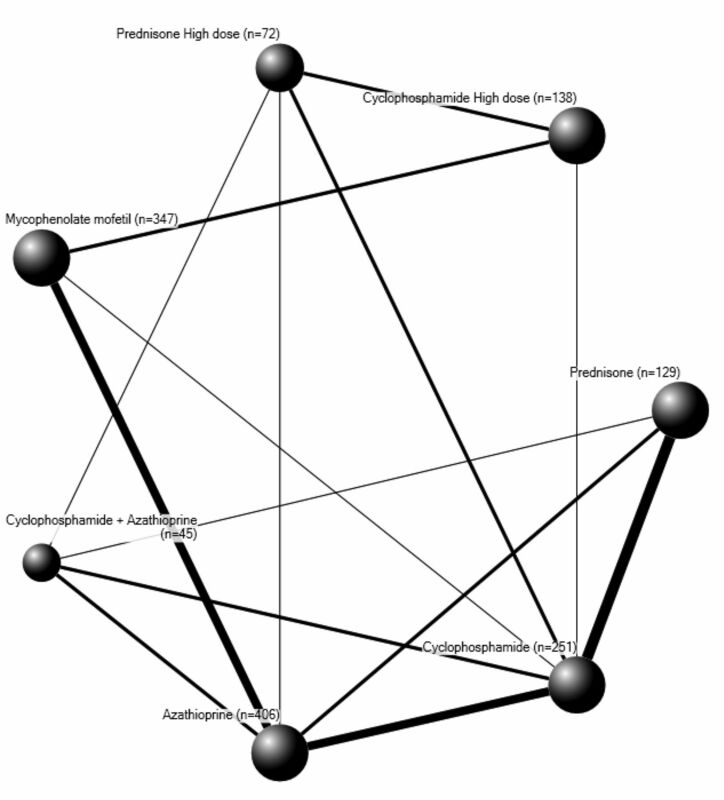 Adverse effects of biologics: a network meta-analysis and Cochrane overview. Cochrane Database Syst Rev 2011:CD008794. Biologics for rheumatoid arthritis: an overview of Cochrane reviews. Sao Paulo Med J 2010;128:309–10. Biologics for rheumatoid arthritis: an overview of Cochrane reviews. Cochrane Database Syst Rev 2009:CD007848. , eds. Cochrane handbook for systematic reviews of interventions, version 5.1.0 (updated March 2011). London: The Cochrane Collaboration; 2011.
. Network meta-analysis for indirect treatment comparisons. Stat Med 2002;21:2313–24. Health outcomes associated with various antihypertensive therapies used as first-line agents: a network meta-analysis. JAMA 2003;289:2534–44. Guidance on the implementation and reporting of a drug safety Bayesian network meta-analysis. Pharm Stat 2014;13:55–70.
. Addressing between-study heterogeneity and inconsistency in mixed treatment comparisons: Application to stroke prevention treatments in individuals with non-rheumatic atrial fibrillation. Stat Med 2009;28:1861–81.
. Prior distributions for the intracluster correlation coefficient, based on multiple previous estimates, and their application in cluster randomized trials. Clin Trials 2005;2:108–18.
. Multiparameter evidence synthesis in epidemiology and medical decision-making. J Health Serv Res Policy 2008;13 Suppl 3:12–22. Controlled studies of oral immunosuppressive drugs in lupus nephritis. A long-term follow-up. Ann Intern Med 1983;99:1–8.
. Long-term preservation of renal function in patients with lupus nephritis receiving treatment that includes cyclophosphamide versus those treated with prednisone only. Arthritis Rheum 1991;34:945–50.
. Progressive lupus glomerulonephritis. Treatment with prednisone and combined prednisone and cyclophosphamide. Mayo Clin Proc 1976;51:484–94.
. Plasmapheresis does not increase the risk for infection in immunosuppressed patients with severe lupus nephritis. The Lupus Nephritis Collaborative Study Group. Ann Intern Med 1991;114:924–9. Treatment of diffuse proliferative lupus glomerulonephritis: a comparison of two cyclophosphamide-containing regimens. Am J Kidney Dis 2001;38:256–64. Mycophenolate mofetil vs cyclophosphamide therapy for patients with diffuse proliferative lupus nephritis. Chin Med J 2002;115:705–9. Induction therapies for class IV lupus nephritis with non-inflammatory necrotizing vasculopathy: mycophenolate mofetil or intravenous cyclophosphamide. Lupus 2007;16:707–12. Influence of race/ethnicity on response to lupus nephritis treatment: the ALMS study. Rheumatology 2010;49:128–40. Therapy of lupus nephritis. Controlled trial of prednisone and cytotoxic drugs. N Engl J Med 1986;314:614–9. Ciclosporin plus steroids versus steroids alone in the treatment of lupus nephritis. Contrib Nephrol 1992;99:129–30.
. Successful treatment of class V+IV lupus nephritis with multitarget therapy. J Am Soc Nephrol 2008;19:2001–10.
. Pulse methylprednisolone therapy in diffuse proliferative lupus nephritis. J Pediatr 1982;101:137–41. Controlled trial of pulse methylprednisolone versus two regimens of pulse cyclophosphamide in severe lupus nephritis. Lancet 1992;340:741–5. Comparison of azathioprine, prednisone, and heparin alone or combined in treating lupus nephritis. Nephron 1973;10:37–56. Efficacy of mycophenolate mofetil in patients with diffuse proliferative lupus nephritis. Hong Kong-Guangzhou Nephrology Study Group. N Engl J Med 2000;343:1156–62. Short-term outcomes of induction therapy with tacrolimus versus cyclophosphamide for active lupus nephritis: a multicenter randomized clinical trial. Am J Kidney Dis 2011;57:235–44.
. Monthly plasmapheresis for systemic lupus erythematosus with diffuse proliferative glomerulonephritis: a pilot study. Can Med Assoc J 1981;125:171–4.
. Chronic plasma exchange in systemic lupus erythematosus nephritis. Proc Eur Dial Transplant Assoc 1983;20:629–35. Sequential therapies for proliferative lupus nephritis. N Engl J Med 2004;350:971–80. Cyclosporine A or intravenous cyclophosphamide for lupus nephritis: the Cyclofa-Lune study. Lupus 2010;19:1281–9.
. Prospective multicentre trial on the short-term effects of plasma exchange versus cytotoxic drugs in steroid-resistant lupus nephritis. Neth J Med 1988;33:168–77.
. Further observations on the treatment of lupus nephritis with prednisone and combined prednisone and azathioprine. Arthritis Rheum 1974;17:573–81.
. Treatment of diffuse proliferative lupus nephritis with prednisone and combined prednisone and cyclophosphamide. N Engl J Med 1978;299:1151–5. Therapy of lupus nephritis. A two-year prospective study. Ann Med Interne 1994;145:307–11. Azathioprine and cyclophosphamide in treatment of patients with diffuse proliferative lupus nephritis - a randomized controlled study [abstract]. Nephrol Dial Transplant 2001;16:A57.
. Is mycophenolate mofetil superior to pulse intravenous cyclophosphamide for induction therapy of proliferative lupus nephritis in Egyptian patients? Clin Exp Nephrol 2010;14:214–21. Mycophenolate mofetil or intravenous cyclophosphamide for lupus nephritis. N Engl J Med 2005;353:2219–28. Methylprednisolone and cyclophosphamide, alone or in combination, in patients with lupus nephritis. A randomized, controlled trial. Ann Intern Med 1996;125:549–57.
. Azathioprine plus prednisone compared with prednisone alone in the treatment of systemic lupus erythematosus. Report of a prospective controlled trial in 24 patients. Ann Intern Med 1975;83:597–605.
. Preliminary study of tacrolimus versus cyclophosphamide in patients with diffuse proliferative lupus nephritis [abstract]. Nephrol Dial Transplant 2007;22 Suppl 6:vi276.
. A controlled trial of plasmapheresis therapy in severe lupus nephritis. The Lupus Nephritis Collaborative Study Group. N Engl J Med 1992;326:1373–9. Is combination rituximab with cyclophosphamide better than rituximab alone in the treatment of lupus nephritis? Rheumatology 2009;48:892–8. Induction therapies for proliferative lupus nephritis: mycophenolate mofetil, tacrolimus and intravenous cyclophosphamide [abstract]. J Am Soc Nephrol 2009;20:391A. Treatment of type IV lupus nephritis (LN) - comparison of 2 triple therapy regimens: cyclosporin a (CSA), prednisolone (PRED), azathioprine (AZA) vs. oral cyclophosphamide (POCP), prednisolone, azathioprine [abstract]. Nephrology 1997;3 Suppl 1:S476. Comparison of high and low dose of cyclophosphamide in lupus nephritis patients: a long-term randomized controlled trial. Saudi J Kidney Dis Transpl 2011;22:935–40. Mycophenolate mofetil versus tacrolimus for active lupus nephritis: an extended observation of a randomized controlled trial [abstract].Ann Rheum Dis 2009;68 Suppl 3:246. A randomized pilot trial comparing cyclosporine and azathioprine for maintenance therapy in diffuse lupus nephritis over four years. Clin J Am Soc Nephrol 2006;1:925–32.
. Mycophenolate mofetil or intravenous cyclophosphamide in treatment of lupus nephritis [abstract]. Ann Rheum Dis 2008;67 Suppl II:349.
. Enteric-coated mycophenolate sodium (ED-MPS) for the treatment of lupus nephritis - MyLupus study [abstract]. J Am Soc Nephrol 2010;21:626A. Randomized controlled trial of pulse intravenous cyclophosphamide versus mycophenolate mofetil in the induction therapy of proliferative lupus nephritis. Nephrology 2005;10:504–10.
. A comparative study of two intensified pulse cyclophosphamide remission-inducing regimens for diffuse proliferative lupus nephritis: an Egyptian experience. Int Urol Nephrol 2009;41:153–61.
. A controlled trial of pulse cyclophosphamide versus pulse methylprednisolone in severe lupus nephritis. Lupus 1994;3:107–12. Randomized controlled trial of pulse/synchronization cyclophosphamide/apheresis for proliferative lupus nephritis. J Clin Apher 1998;13:163–6. EULAR randomised controlled trial of pulse cyclophosphamide and methylprednisolone versus continuous cyclophosphamide and prednisolone followed by azathioprine and prednisolone in lupus nephritis. Ann Rheum Dis 2004;63:525–9. Mycophenolate mofetil or tacrolimus compared with intravenous cyclophosphamide in the induction treatment for active lupus nephritis. Nephrol Dial Transplant 2012;27:1467–72. Pilot 24 month study to compare mycophenolate mofetil and tacrolimus in the treatment of membranous lupus nephritis with nephrotic syndrome. Nephrology 2012;17:352–7.
. Repeat kidney biopsies fail to detect differences between azathioprine and mycophenolate mofetil maintenance therapy for lupus nephritis: data from the MAINTAIN Nephritis Trial. Nephrol Dial Transplant 2012;27:1924–30. Outcomes of maintenance therapy with tacrolimus versus azathioprine for active lupus nephritis: a multicenter randomized clinical trial. Lupus 2012;21:944–52.
. Long-term follow-up of a randomised controlled trial of azathioprine/methylprednisolone versus cyclophosphamide in patients with proliferative lupus nephritis. Ann Rheum Dis 2012;71:966–73.
. Efficacy of mycophenolate mofetil in adolescent patients with lupus nephritis: evidence from a two-phase, prospective randomized trial. Lupus 2012;21:1433–43.
. Mycophenolate mofetil or intravenous cyclophosphamide for lupus nephritis with poor kidney function: a subgroup analysis of the Aspreva Lupus Management Study. Am J Kidney Dis 2013;61:710–5.
. High-dose cyclophosphamide versus monthly intravenous cyclophosphamide for systemic lupus erythematosus: a prospective randomized trial. Arthritis Rheum 2010;62:1487–93. Efficacy and safety of enteric-coated mycophenolate sodium in combination with two glucocorticoid regimens for the treatment of active lupus nephritis. Lupus 2011;20:1484–93. Mycophenolate versus azathioprine as maintenance therapy for lupus nephritis. N Engl J Med 2011;365:1886–95.
. Increased incidence of herpes zoster among patients with systemic lupus erythematosus. Lupus 2013;22:238–44. Herpes zoster vaccination in SLE: a pilot study of immunogenicity. J Rheumatol 2013;40:1875–80.
. Systemic lupus erythematosus complicated with thymoma and pure red cell aplasia (PCRA). CR of both complications following thymectomy and allogeneic haematopoietic SCT (HSCT), but persistence of antinuclear antibodies (ANA). Bone Marrow Transplant 2014;49:982–3.
. Immunosuppressive therapies for the induction treatment of proliferative lupus nephritis: a systematic review and network metaanalysis. J Rheumatol 2014;41:1998–2007.
. Simulation evaluation of statistical properties of methods for indirect and mixed treatment comparisons. BMC Med Res Methodol 2012;12:138.